MRSA Care & Prevention · Hy-Tape International, Inc.
Doctors and scientists once believed MRSA only affected people in hospitals, but now we know MRSA affects people in many other institutions and settings (i.e. community-acquired MRSA). Today, community-acquired MRSA is as virulent and aggressive as hospital-acquired MRSA, if not more so. Because the bacterium is resistant to certain types of antibiotics, treating MRSA can be difficult. Making matters worse, unless MRSA is fully eradicated, it can return and re-infect. What is the difference between infection and colonization? The major difference between infection and colonization is whether MRSA causes obvious symptoms. A MRSA infection of the skin is rather obvious; it causes an open wound with redness, warmth, and, swelling. There is usually some break in the skin, and the area is usually sore or painful. MRSA colonization is just the opposite. People who are colonized with MRSA simply carry the bacteria on their skin and have no symptoms at all. Common places for MRSA to colonize are the nostrils, the armpits, the rectal region, and around chronic wounds.3 Importantly, these wounds are not caused by MRSA; MRSA tends to live near the wounds without immediately causing a MRSA infection. How do I prevent MRSA? People pass MRSA amongst one another through contact. This contact can be direct or indirect. An example of direct contact is a person, colonized or infected with MRSA, who touches another person and transfers bacteria directly. An example of indirect contact is a person who may touch something that carries MRSA, such as an unclean towel in a locker room or stethoscope in a hospital. Because MRSA is transmitted through contact, one of the best ways to prevent transmission is through meticulous hygiene. While MRSA is resistant to antibiotics, it cannot withstand the killing power of alcohol-based hand sanitizer. People can reduce their risk by frequently cleansing their hands with hand sanitizer. Indeed, since hospital-acquired MRSA is most commonly transmitted to patients by the contaminated hands of their healthcare providers, patients should insist that their caregivers cleanse their hands before any patient contact. 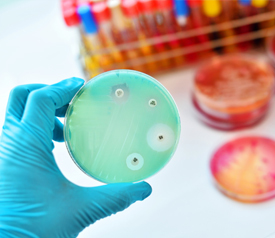 In institutions, common use items should be treated as if they were potentially infectious. Workers should use gloves while handling reusable towels and clothing, and launder those items in hot water. People who have MRSA infection, have had a recent MRSA infection, or who may be colonized with MRSA should strongly consider using disposable items, when possible. This not only decreases the risk of infecting others, but it also decreases the risk of prolonging the infection or having the infection return. Patients can stop MRSA colonization by using triple antibacterial ointments in areas known to harbor MRSA (e.g. nostrils). As mentioned earlier, MRSA resides in and around chronic wounds. This is not necessarily because of the wound, but because of the items used to care for that wound. MRSA is found on catheters that enter the skin, the bandages used to cover wounds, and the tape used to cover those bandages. Allowing MRSA to stay on these items increases the risk of infection to the patient, to the patient’s caregivers, and to other people who may come in contact with those caregivers. Hy-Tape is perhaps the ideal choice for chronic wound care, especially for those who are at risk for MRSA. This includes currently or recently hospitalized individuals, those who live in long term care facilities, or anyone who frequently requires medical care or wound care. As we now know, MRSA moves from objects to people through contact. Rolls of tape are notorious for carrying potentially harmful bacteria. For instance, researchers found that three out of four rolls of hospital tape are covered with pathogenic bacteria.6 Frighteningly, the researchers collected tape from people who were carrying the tape around the hospital in their pockets, and using these rolls of tape on multiple patients. To help protect patients and healthcare providers from MRSA carried on tape, caregivers should never carry a single roll of tape from room to room. Furthermore, they should never use a single roll of tape to care for more than one patient. Instead, one patient should have one, dedicated roll of Hy-Tape at any given time. Hy-Tape makes this easy and economical, since rolls come in various sizes, even down to single use rolls. In fact, single use rolls of Hy-Tape allow you to leave a single roll with each patient without worrying about wasting tape or raising healthcare costs. If you would like a free sample of Hy-Tape, simply let us know. We take MRSA infection very seriously, and we want to do our part to help prevent it. Singer AJ, Talan DA. Management of skin abscesses in the era of methicillin-resistant Staphylococcus aureus. N Engl J Med. Mar 13 2014;370(11):1039-1047. Miller LG, Eells SJ, David MZ, et al. Staphylococcus aureus skin infection recurrences among household members: an examination of host, behavioral, and pathogen-level predictors. Clin Infect Dis. Mar 1 2015;60(5):753-763. Popovich KJ, Aroutcheva A, Hota B, et al. Anatomic Sites of Colonization with Community-Associated Methicillin-Resistant Staphylococcus aureus. Infection control and hospital epidemiology. 07/25 2014;35(9):1192-1194. Reddy KM, Feris K, Bell J, et al. Selective toxicity of zinc oxide nanoparticles to prokaryotic and eukaryotic systems. Appl Phys Lett. May 24 2007;90(213902):2139021-2139023. Ansari MA, Khan HM, Khan AA, et al. Characterization of clinical strains of MSSA, MRSA and MRSE isolated from skin and soft tissue infections and the antibacterial activity of ZnO nanoparticles. World J Microbiol Biotechnol. Apr 2012;28(4):1605-1613. Redelmeier DA, Livesley NJ. Adhesive Tape and Intravascular-Catheter-Associated Infections. J Gen Intern Med. 1999;14(6):373-375.